Most of us are familiar with olive oil and the inherently positive cardiovascular effects derived from including this monounsaturated fat in our diets. Now consider the part of an olive tree responsible for it's photosynthesis or respiration. It is from olive leaves that man has obtained tremendous relief, resulting in a more enhanced state of physiological health and well-being. Yet today, few people are even aware of its potential. Seldom does a singular botanical provide such a wide spectrum of healthy applications as olive leaf extract. Out of 98 known chemical constituents, the phytonutrient responsible for the greatest range of therapeutic activity is oleuropein. This versatile chemical compound supplies our bodies with extraordinary antibacterial, anti-viral, and anti-fungal support. The most important thing to understand is that a product based upon and formulated with the highest concentration of oleuropein ends up being the most effective product. Synthetically produced solutions of calcium elenolate, elenolic acid and other mysterious ingredients are continually being offered up as magic bullets, intended to eradicate a host of maladies... The greatest degree of awareness comes from understanding how oleuropein works, while recognizing that other synthesized compounds are nowhere near as effective in addressing various ills that plague so many. It is important to observe how oleuropein is broken down and utilized by the body. In human blood two enzymes, esterase and beta-glucosidase convert oleuropein into d-elenolic acid. This (d-) isomer of elenolic acid is the only form that does not bind to blood serum plasma proteins (which would render it ineffective), allowing it to be fully used in the body as a natural virucide. When synthesized outside of the body, its physiological effectiveness is nullified. In the late 1970s, Upjohn Laboratories "proved" that point: After fabricating synthetic l-elenolic acid, produced in vitro (outside of the body using chemical reagents), they found that the l- form would bind to blood serum proteins, rendering it ineffective systemically as an anti-pathogenic agent. Only after natural, concentrated oleuropein is made available to the body can natural d-elenolic acid be produced and released into the bloodstream to work efficiently and effectively. Herein lies the importance of focusing on concentrated oleuropein from olive leaf extract when addressing your own concerns. Oleuropein provides you with a powerful and unadulterated assemblage of unique nutrients and co-factors (i.e. d-elenolic acid). Once again, the olive leaf extract providing the highest concentration of oleuropein will furnish your body with the most effective array of systemic agents, working with your system to eradicate multiple pathogens, yeast, viruses and a host of dangerous bacteria. There can be no viable rationale for choosing a synthetic or chemically altered form of oleuropein. Other compounds synthesized from olive leaf pale in comparison to the most respected product designed for a new millennium. 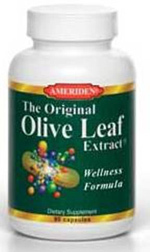 Ameriden's Olive Leaf Extract provides you with the most efficacious and untarnished olive leaf extract anywhere, supplying the highest concentration of oleuropein available.